Note: This review contains potential spoilers for those fans who have not read the books. With the first six episodes of A Series of Unfortunate Events, there was always the opportunity—and temptation—to compare their adaptation of the source material to the movie, which unwisely combined the plot of the first three books into one feature film. Where the film had Meryl Streep as the grammarian Aunt Josephine, whose fears of everything from doorbells to real estate agents turned her from formidable to frail, the series has Alfre Woodard giving her own interpretation. 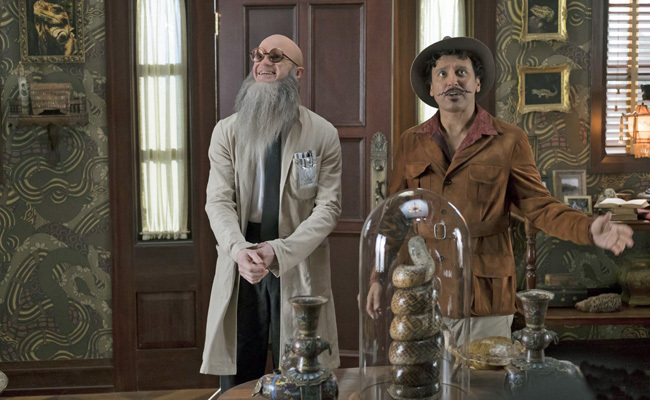 Where the movie lacked any kind of racial or ethnic diversity in the cast, the show is clearly devoted to making sure the peculiar guardians and other sundry characters who work in the shadows represent a variety of backgrounds, most notably, Woodard’s Josephine, K. Todd Freeman’s oblivious Mr. Poe, and Aasif Mandvi’s exuberant, ebullient Uncle Monty. In nearly all cases, the more diverse approach to the casting of the Netflix series pays off. Neil Patrick Harris and Aasif Mandvi. The rest of this review can be found on PopMatters.